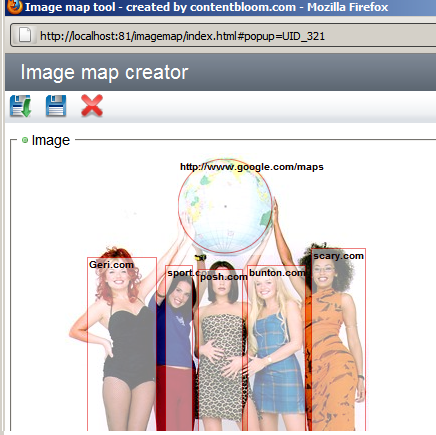 I recently spoke to someone who had the requirement for creating image maps inside SDL Tridion. Seemed like a pretty strange request as I didn’t think people still used image maps, but I thought it would make quite a cool little extension… so during a 9 hour stay over at an airport I decided to knock up a prototype. 1. How to download and install the SDL Tridion image map tool. 2. How to use the SDL Tridion image map tool. If this is something that your company or client can benefit from, (or there are any issues!) let me know in the comments. This entry was posted in Extensions, Tridion 2011 by John Winter. Bookmark the permalink. Over the last 15 years, John has lead over 50 SDL Tridion implementations for major clients including, Alliance Data, Viking Cruises, Lexus, Dunlop, Dexia Bank, Toyota and SKF. John manages the USA side of Content Bloom, undertaking a variety of tasks including consultancy, development, architecture and trainer.